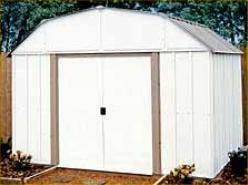 Metal sheds are available in many different styles, sizes and colors. Steel storage buildings are the most economical compared to wood, vinyl, or plastic storage sheds. Why should I buy a metal storage building? Metal storage buildings are the most economical form of storage compared to wood, plastic, and monthly storage unit rental. What tools do I need to assemble a steel storage building? At the very least you will need a #2 Phillips screwdriver, a pair of pliers, work gloves (to prevent cuts), and a stepladder. A cordless screwdriver will speed up your assembly time by quite a bit. Do not try assemble the building alone or in windy conditions. What kind of foundation should I use for my metal storage shed? The key to a successful installation is to make sure the building is assembled on a square and level surface. 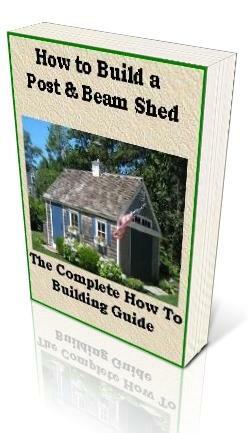 You have several choices - pour a concrete slab, build a wood deck/floor, or use a shed floor frame foundation kit from the manufacturer. Do I need to anchor my steel storage building? Absolutely. Your storage building must be anchored to prevent possible wind damage. Some companies offers ground anchor kits, with ground augers, cable, and clamps. There are also concrete shed anchor kits and other fasteners like Simpson Strong-Ties available for anchoring your shed to a concrete floor or footings. No comments or reviews yet.